Arrange your precious gems into color matches before they overflow. "I love this game and it has been unavailable on my Big Fish game membership. This is my all time favorite game." 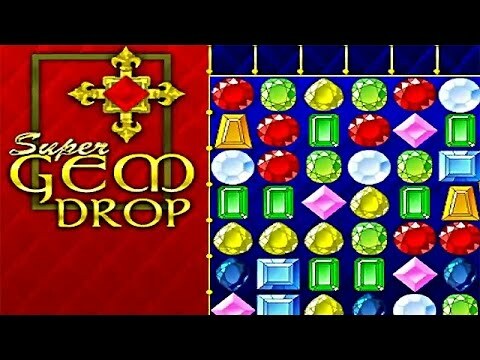 Easy to learn and a lifetime to master, Super Gem Drop is a game of strategic thinking, planning and a smooth trigger finger. Anyone can get three of the same gems to line up, but can you think far enough ahead to create the cascades that get you the big bonuses? You'll find yourself playing into the night as you take on level after level of this addictive puzzler. I have always liked this game, and have been looking to re-purchase it for it for a long time. I'm happy to have found it on GameFools. The first time I played this game, I had dial-up Internet. I got hooked and am still playing it. It starts off slow and easy, then it gets faster and faster. I spend hours playing it. Super Gem Drop flows really great. Bright colors and extremely fun to play.Been playing this game for years and it never gets old! I like very much! It's a funny and highly addictive game. I love this game! It keeps me active in my old age. Thank you so much for it and you're welcome for my purchase!